Performances by the WEISER YOUTH SYMPHONY and the TURNER YOUTH THEATER are held in the auditorium from time to time and will be performing again this year. We are always up to something at the Weiser Museum. On this page you will find an update list of current events being hosted by the Weiser Museum. Ever wonder about how the Intermountain Institute came about or other interesting facts about this great building. Now you can see it on your TV. "The Old Tute" DVD about the Museum is available in the Museum Store. 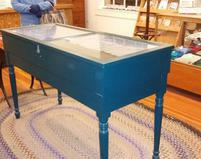 We are in need of display cases similar to the one shown above. If you have one you would like to donate or sell to us at a reasonable cost we would be interested. National Old Time Fiddle Contest June 16-22, 2019. Stop by the Museum to see all the activities going on there. A great deal of activity has gone on at the museum during 2015! We had many people and groups volunteer. They moved many, many items, cleaned, painted, created, and brought to light many artifacts from the depths of the building. You will be in wonder at the magic that has happened with new floors, painting, new rooms of displays and many labels!!! New rooms include the Native American Room, Ranch Room Intermountain Institute Story Room, as well as an old fashioned store in our Gift Shop. Check out the first floor hallway that features "Weiser the Way It Was" of local interest. More changes to the Automotive History Room also.